After lunch on the second day of the The Wine Academy of Spain Spanish wine course, we covered Levante, the Islands, and Extremadura & Madrid, although there were no wine tastings for these regions. It was almost 2 hours of videos and lecture, which was interesting, but, admittedly, after eating lunch and trying to avoid coffee so as not to taint the tasting experience, it was also a little hard to stay focused. That combined with knowing that Rioja was at the other end of the 2 hours made everyone in the room a little antsy. So, once we finished learning about Levante, the Islands, and Extremadura & Madrid, we took a short break before diving into Rioja. 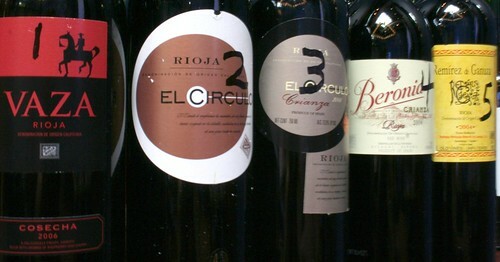 Rijoa is really divided into 3 regions, with wine from each area tasting slightly different. Rioja Alta is an Atlantic climate, so the wines tend to be full bodied, high in alcohol and acidity, and often aged in casks. Rioja Alavesa has a mixed Atlantic and Mediterranean climate. Wines from this region tend to have lower alcohol and acidity, might go through carbonic maceration, and usually are ready for drinking earlier than the Rioja Alta wines. Finally, Rioja Baja has a Mediterranean climate. This area is known for both reds and rosés, both of which often have higher alcohol content.